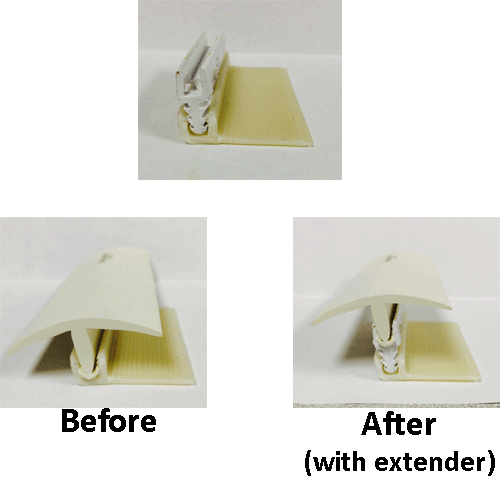 This t-molding track extender will give your floor transition strips up to 5/8" more height! Vinyl t-moldings usually only have 1/4" to 1/2" tall leg but this extender will boost that up. 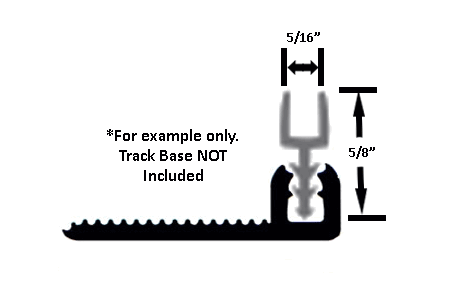 The t-molding track extender is made by Mannington and is a plastic clip that is inserted into your vinyl track base. The vinyl t-molding is then snapped into the Mannington extender. Our t-molding track extender is intended to be used with Mannington transition strips, but will work with the Johnsonite products as well. Most vinyl t-moldings are sold in 12 ft sections and so is this extender for a perfect match. Plastic clip extends height 5/8"
Note: Mannington and Johnsonite vinyl t-moldings will work for this product. Do not use with aluminum track base. The t-molding track extender is not stocked and will ship out 1 to 2 weeks depending on availability. Order vinyl t-moldings with us today along with the t-molding track extender to save on shipping costs!